mode only. 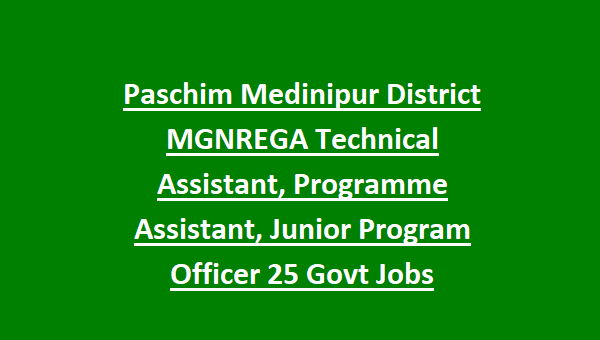 For applying Technical Assistant jobs candidates can go through the official website of Paschim Medinipur District MGNREGA is www.paschimmedinipur.gov.in. The online application forms will be available from 1-10-2018 onwards. The closing date for applying online application forms is 26-10-2018. The candidates will be shortlisted on the basis of merit in written test, computer test and interview. For the other information of age limit, salary or pay scale, educational qualification and how to apply are given below for the posts of Technical Assistant jobs in Paschim Medinipur District Recruitment Notification 2018. The age limit for the Jobs in Paschim Medinipur District MGNREGA Recruitment 2018 is in between 18 – 40 years as on 01-01-2018. Junior Programme Officer – Graduate Degree in Honors (55%) + 6 months computer course certificate. Technical Assistant – Diploma in Civil Engineering. Programme Assistant – 10+2 Passed (60%) in Science, Physics and Mathematics + 6 months Computer course certificate. Computer Assistant – H.S. Passed + 6 months computer course certificate and minimum sped of data entry 6000 key depression per hour. Technical Officer – Degree in Honors (55%) in Agriculture + 6 months computer course certificate. For Junior Programme Officer salary is – Rs.17440/-. For Technical Assistant – Rs.19620/-. For Programme Assistant – Rs.11990/-. For Computer Assistant – Rs.11990/-. For Technical Officer – Rs.17440/-. For the application fee candidates can refer the official Notification. The candidates will be selected based on merit in written exam, computer test and interview. The shortlisted candidates for personal interview should bring the original document, photographs, identity proof and experience certificate for verification. The selected candidate will have to go for a contract on non-judicial stamp paper of Rs.10/- every year with DPC. Candidates will check in the official Notification of Paschim Medinipur District MGNREGA. Interested candidates can apply through online mode only. 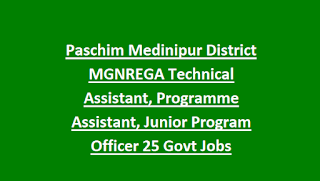 The official website for applying these jobs is https://www.paschimmedinipur.gov.in/ from 01-10-2018. The last date for submission of application through online is 26-10-2018.